The Manor House, Daylesford, proudly boasts an incredible 8 bedrooms and 8 ensuite bathrooms. This magnificent, vast home was purposely built as a Daylesford accommodation holiday guesthouse, giving consideration to privacy, wellness and collective adventures. You can book The Manor House with The Station House, which is right next door on the same property, with our ‘Group Stays‘ option. Both can accommodate up to 26 Guests. Stately and distinguished, The Manor House is situated on 3 sprawling acres of estate just outside the centre of Daylesford. The Manor House’s 8 beautifully styled bedrooms each have an en-suite and can comfortably accommodate up to 16 guests in total. This impressive residence will enchant holidaymakers and awe co-workers, offering ample facilities for both work and recreation. Onsite parking and free WiFi add a touch of convenience. Enter this substantial home and be dazzled by a rustic, bespoke dining table set in a vast open-plan dining and kitchen area. Look beyond the unique dining arrangement to find the great room – a magnificent lounge area bedecked with sophisticated art, comfortable furniture and centred by a spectacular, double-sided fireplace that will infuse this grand space with warmth and light. For those admirers of art, classical busts and paintings adorn the mantle on one side, but if you are just looking to switch off and unwind, then enjoy the large couch and television on the reverse. Fill this group-oriented space with laughter, fun and relaxation, especially over a good meal! What manor would be complete without a substantial kitchen? A white brick tile splashback defines the otherwise open cooking area. The bedrooms are lavishly furnished, each boasting king beds and an en-suite. As spacious as they are pleasing to the eye, these rooms maintain the elegance and grandeur of the rest of the The Manor House. If you’ve the mind for a classic Aussie barbeque with a high-class twist, then The Manor House can easily accommodate. The building is encompassed on all sides by an elegant verandah, but you will likely want to venture out into the immense garden beyond to satisfy your needs for food and recreation. The barbeque area mirrors the communal space of the great room with another large table, this time set on an island of gravel right amidst the lush green of the garden. Come together, eat, listen to music and let the beauty of this property charm you. The Manor House is located within strolling distance of the famous Daylesford Sunday Market, so make sure to wander down and experience one of the town’s weekend highlights. The Manor House shares a large block with another one of our properties, The Station House, making them an ideal pair to book for large groups of up to 26 guests. The Daylesford Wombat Hill Botanical Gardens and Convent Gallery invite exploration nearby, while the main street of Daylesford waits not far off with its restaurants, cafés and shops. Or, if you like, it is more than possible to enjoy your entire stay within the private luxury of The Manor House and its estate. Whether it be for work or play, leave the stress of everyday life behind and spend your time in Daylesford immersed in the utmost splendour and peace at The Manor House. We spent a magical eight nights at the Manor House and found it very hard to leave. The house is everything you'd want it to be - spacious living area, quiet rooms, comfy beds, clean bathrooms, lots of hot water, huge shady yard, lovely BBQ and outdoor space, big communal tables, fabulous cooking facilities, short walk to town and lovely hosts. Thanks Tony and Theresa! The Manor House was beautiful. Gorgeous bedrooms. Beautifully styled. Our group of four families were able to share the home very comfortably, with great areas to dine and relax by the fire. Pretty Gardens and outdoor BBQ area. We truly had a great time. A wonderful house with great facilities. 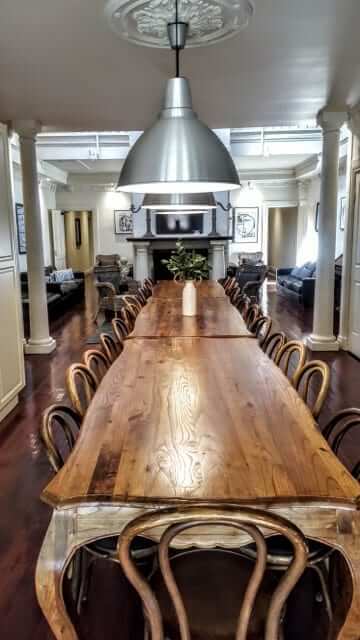 We used it for a work strategy retreat and it was perfect with enough space for groups to break out for discussions and a wonderful shared space for team dinners. You may be interested in our other properties – See what The Lodge has to offer your next vacation, nestled amongst 3 acres of Australian woodland, or check out York House, perfectly located in the heart of Daylesford, or browse our other luxury choices in Daylesford accommodation.